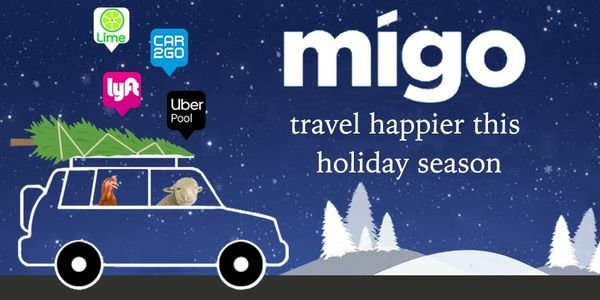 Ride Share, Carshare, Taxis, Bikes, We’ve Got You Covered in Washington DC with Migo! There are 68 ways to get around Washington DC, District of Columbia, and 43 of the best ways are available through an app! Choose between 7 carshare, 13 taxi, 10 rideshare, bikeshare, or 33 black car/limo companies. The best 7 ways to get from A to B in Washington DC are on Migo. Whether you need the closest, cheapest, or fastest ride, Migo has all of them in one app. Scroll down to see all the different transportation apps available on iTunes or GooglePlay. Choose from one of the providers below to help you get around Washington DC today. Wherever you're headed, count on Lyft for rides in minutes. Scoop is a convenient & enjoyable way for your employees to carpool. A peer-to-peer ridesharing, taxi cab, food delivery, bicycle-sharing, and transportation network company. Visit Georgetown Cupcake for a sweet treat after wandering the streets and local boutiques. Tour the Library of Congress, and be sure to get a good look at its amazing ceiling! Walk down 18th street to check out the variety of eateries and music venues tucked away in nondescript buildings. Take a breather from your busy day and sit at Dupont Circle to enjoy the passers by and maybe watch a game of chess! Head to the White House Visitors Center for some extra details and exhibits for information on this iconic building! If you've got some spare time, take a walk through the Exhibit Hall which offers a look into the airport's rich history! Take the elevator to the very top of the monument for incredible views of the entire D.C. area! Head here early in the morning or late at night to avoid the mid-day crowds and get some unparalleled views of the National Mall. Read about what's new at Migo in Washington DC.